Whereas consumer tech has the Mary Meeker report for an aggregate view of industry trends, enterprise infrastructure was missing a public perspective to explain what we believe is a seismic new wave that only comes once every 10 years — the shift from cloud to what Jerry Chen of Greylock aptly calls systems of intelligence. We’re launching a report series that gets into the details on how systems of intelligence changes the rules of the game spanning the tech industry and beyond. The full deck can be viewed here. With this key inflection point, our primary aim is to help founders see the forest from the trees. For Fortune 1000 executives and other players in the ecosystem, it will help cut through the noise and marketing hype to see what really matters. Perhaps it will get new talent excited about the enterprise. Our perspectives are shaped by anecdotal evidence based on our interactions with entrepreneurs, corporate customers, and big tech leaders defining this new wave. By no means will most of my predictions be correct, but my purpose is to put a stake in the ground and start the discussion on this industry shift. Behind each of these themes are opportunities for early-stage entrepreneurs and lessons learned from the field. Nearly every competitive Series A or B deal in AI that comes across our desks at Work-Bench has a valuation north of $100M attached to it. It’s easy for investors to get giddy over 10+ PhDs from Stanford and Berkeley holed up in an office in Palo Alto working on something monumental. Call me crazy, but funding these types of companies with no clear path to commercialization seems unsustainable. Add the numerous startups touting the AI label without the expertise to back it up, the big tech increasingly saying “we can build that internally,” and we have a recipe for disaster. The effects won’t ripple across America like in the dot come bubble, but they’ll certainly be felt in the Valley. I’m personally excited for this pattern change. Like in the Internet Era, where the largest and most enduring companies like Amazon and Google rose after the trough of the bubble, massively successful new companies using AI to reshape business will flourish just as the AI weather gets breezy. These transformative new companies will deliver value through Systems of Intelligence. Systems of Intelligence are like Ford Assembly Lines and Toyota Production Systems – powerful weapons for competitive advantage. Much like Ford and Toyota developed impenetrable process moats through tight integration of partners, suppliers, and unique internal processes, systems of intelligence forge barracks through the perfect portmanteau of data, algorithms, domain expertise, and data-driven product design. Today’s tech monopolies rule through economies of scale. Tomorrow’s will rule through Systems of Intelligence. The race is well underway. GE, Bosch, Samsung, Hitachi, and Schneider Electric are competing for industrial systems of intelligence. Startups are building Systems of Intelligence for banking compliance, pharmaceutical drug development, medical diagnosis, insurance claims filing, and more. Who isn’t building Systems of Intelligence? The ones who are building just about everything else — Amazon, Google, and Microsoft. 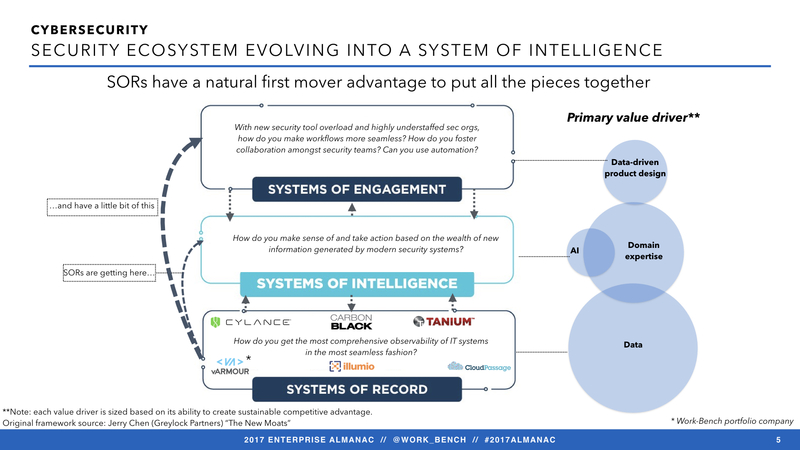 Clayton Christensen recently tweeted “any strategy is (at best) only temporarily correct.” At least now, the strategy for enterprise technology startups is Systems Of Intelligence. Systems of intelligence must ride on nimble infrastructure. Cloud native architectures have the horsepower. As the new cloud native crest rises, problems that required dedicated solutions in the previous cloud wave become invisible functions embedded in the background of a leaner, meaner architecture. Traditional middleware (i.e. enterprise service buses, complex event processing, application servers) are disappearing as these functions get embedded in code. Service meshes abstract networking functions via lightweight proxies. The big data stack is crumbling as Hadoop gets replaced by new tools natively integrated with cloud native workload schedulers. As old systems shed, new ones powering the Systems Of Intelligence revolution are emerging. The race is on for stream processing as new stream native solutions like Kafka Streams and Twitter Herron go up against multi-purpose batch systems with stream bolt-ons like Spark. Open source has been all the rage in machine learning, but deployment and model/data collaboration are still a major challenge that commercial vendors like Algorithmia, Dataiku, and Pachyderm are working to solve with a cloud native and serverless bent. Security, like any other business function, is an amalgamation of people, processes and technology coordinated to manage risk. So it makes for a perfect case study on the shift to systems of intelligence (SOIs). Breakout leaders like Tanium, Cylance and vArmour dominate the world of perimeter-less security. Once small and insignificant to the legacy incumbents, they leveraged their fundamentally re-architected security instrumentation to extend beyond “point solutions” into powerful multi-product suites faster than incumbents could catch drift. With significant footprint and unprecedented ability to inject systems data, they are mighty systems of record (SORs) with first-mover advantage in systems of intelligence. But pure-play security analytics vendors are in many ways already there. Simultaneously new startups like Twistlock, Aqua Security, StackRox, Signal Sciences and tcell.io have SOR hats on trying to carve out real estate up the stack at the container image and application server/code tier. Last but not least, systems of engagement (SOE) are the consumers leveraging the SOI tier to build applications for security analysts. SOAR startups like Phantom, Siemplify, Evident.io and Awake Networks are currently receiving attention for defining workflows automation to meet the challenges of modern security operations. It will be fascinating to see how SORs make this transition, or whether they are superseded by pure-play SOIs and relegated to “plumbing.” Regardless, expect to see a telling tale of systems of intelligence dominating the security industry storyline the next several years. Are there security opportunities outside of systems of intelligence? You bet there are. Moving forward, we’d like to see changes to the core security mechanics which haven’t seen step-function improvements since the dark ages of IT. New buzz in homomorphic encryption is a first step in this direction. As we shift to a cloud native security model, innovative new control functions are bound to emerge. Everyone talks about it, nobody really knows how to do it, everyone thinks everyone else is doing it, so everyone claims they are doing it. Don’t believe the trillion dollar forecast figures, they are all but lies. You need on-board machine learning to alert of malfunctioning gears. In the case of danger, there is no time to process in the cloud. Nvidia is making endpoint ML a reality with purpose built chips, but how many of those are on transport trains today? You need a network of nearby cell towers and gateways to transmit key sensor stats to the cloud where recommendation systems identify the best diagnosis. GE Predix will give you the building blocks for the diagnosis application, but how do you govern data flow across endpoint, edge, and cloud? Alluvium, Imubit, and Falkonry are distributed analytics startups bridging this gap, but it’s still early days and each are purpose built to use case. 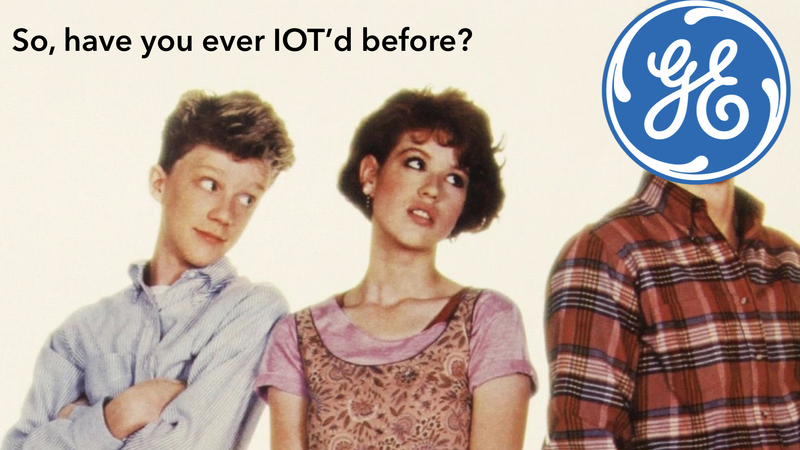 Industrial IoT is the next big wave in enterprise software, but don’t expect hockey stick growth as the pundits forecast. IoT systems are too specialized to use case for exponential growth curves. It will be a long, protracted rise to the massive multi-billion dollar promises. From realities come opportunities. Enterprises will use multiple IoT platforms coordinated like assets in a supply chain. I’m not much for cheesy buzzwords, but systems management 2.0 (IBM Tivoli, BMC Software = 1.0) is just around the corner. More broadly, fragmentation in IoT exposes opportunities for startups to develop highly specialized Systems of Intelligence. The most successful will wrap SOIs into easy to use software, and work with assets already connected to the internet rather than develop their own hardware. They are challenged with selling to first-time/unsophisticated technology buyers in industrial operation centers. Amazon, Google, and Microsoft are riding the cloud wave faster and stronger than any small company can. The time is now for entrepreneurs to define the new wave of Systems of Intelligence. If you are ready to make it happen, I’d love to connect @ItsYamnitsky. Disclaimer: vArmour is a Work-Bench Ventures portfolio company.